The Ferret Association of Connecticut operates a small, limited capacity, “no-kill” shelter. We can house about 20 ferrets. Because we do not euthanize healthy animals, we can not accept every ferret. 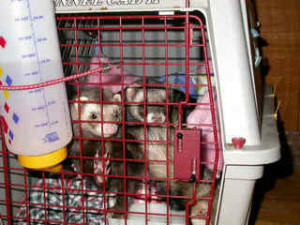 FACT does not have the capacity or the funding to board or hold ferrets for people facing personal or economic issues. Due to our size, even 1 extra animal in the shelter means turning away another in need. Upon request, we may be able to refer you to private homes willing to temporarily board ferrets for a reasonable fee. Thinking of Giving Away Your Ferret? Older (4 years+) ferrets may become extremely stressed and/or ill entering a shelter environment. Since a ferret’s lifespan is normally only about 6 years, please carefully consider whether placement is the best option for your pet. We are happy to give information or suggestions that might allow you to keep your ferret. It is tempting to imagine a perfect home where your pet will receive all the care and attention it might lack, but those homes are rare. A slightly imperfect home is better than no home. Some of the suggestions here may help you overcome some common problems. We feel that YOU are the best qualified person to find a home for your pet. You know everything about your ferrets and their habits. It will reduce the level of stress they are going to experience and if approached properly, you can you rest assured that you have done everything possible for them. These tips should help. Following is information on the Ferret Association of Connecticut’s Admission Process.